id Software has continued to update and improve Quake Champions throughout Early Access based on the feedback and requests of the player community. This week on Dec. 14, Quake Champions will receive one of its largest updates to date, delivering new content and features including a new Champion, Keel, who returns from Quake 3 Arena and Quake Live; a new arena for Duel and 2v2, Vale of Pnath; Ranked Play and Leaderboards; plus a ton of festive, holiday-themed gear and maps for a limited time. NEW CHAMPION – Keel is Back! Quake 3 Arena’s resurrected war machine Keel will join the roster of heroes next week, bringing a Grenade Swarm active ability that allows him launch a barrage of grenades and the Stockpile passive ability, which reduces the cooldown on Grenade Swarm with every ammo box he picks up. Keel will be free for players who own the full Champions Pack and available for purchase using Platinum via the in-game store for everyone else. NEW DUEL MAP – Vale of Pnath – Duel mode’s pure test of skill has ignited competition in Early Access, and next week players will get another arena dedicated to 1v1 and 2v2. Vale of Pnath is a wickedly vertical shrine to the Elder God Ithagnal built atop treacherous acid-filled caverns. 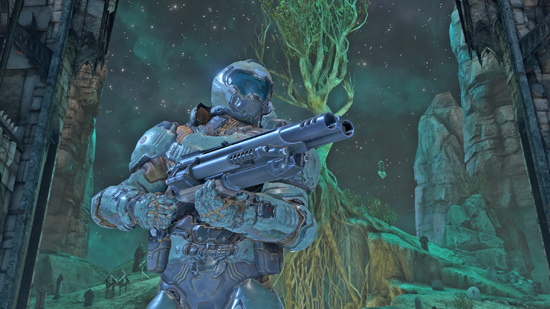 This new map is free for all players of the game – get in there and face off with your friends! RANKED PLAY AND LEADERBOARDS – Quake Champions is the most intense FPS competition on any platform, and now Early Access players will be able to take their skills to the next level and easily see where they rank against the best in the world. CHRISTMAS CELEBRATION – Celebrate the holidays with specially themed items including animated Champion shaders and festive weapons shaders, holiday decorations on Burial Chamber and Corrupted Keep, holiday hat vanities for Champions, and limited edition profile icons and nameplates. CROSSHAIR CUSTOMISATION – One of the most requested features from the community will go live with the December update, allowing players to choose from 40 different crosshair options and use a slider to select the color of their choice.